Not since the release of this beautifully backlit view of Saturn have we found ourselves so arrested by an image of the ringed planet. Which, for a celestial body as consistently photogenic as Saturn, is truly saying something. "On October 10th, [the Cassini spacecraft's] wide-angle camera captured a set of 12 RGB footprints [36 photos total, acquired with red, green and blue filters which, when combined, approximate true color] covering Saturn and the rings," writes Gordan Ugarkovic, who created the image, in a comment thread over at Unmanned Spaceflight. He continues: "Here's an attempt at compositing that data into a mosaic. It's not geometrically accurate, but I tried coaxing the data into at least looking nice." The detail is incredible. Cassini was high above Saturn to the north, looking “down” on the ringed world when it took these images. You can see the bizarre hexagonal north polar vortex, the six-sided jet stream flowing around Saturn. The subtle but beautiful bands mark the cloud tops of Saturn’s atmosphere. Unless I'm mistaken, the thin white line you see wrapping around the planet at mid-latitude is the remnant of a vast stormso huge it completely dwarfed our own home world of Earth. And if you look carefully (you can measure it!) 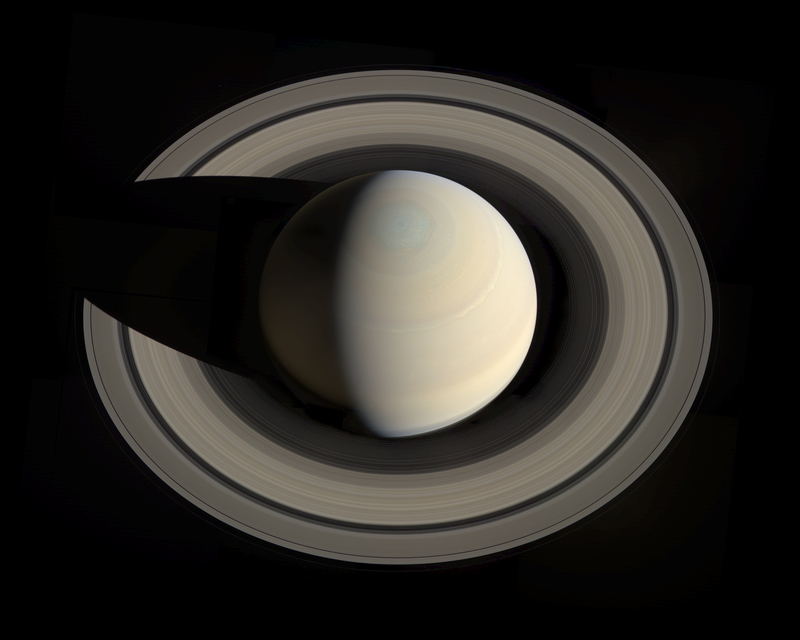 you can see that Saturn is highly flattened, its equatorial diameter wider than through the poles. And that's just for starters. 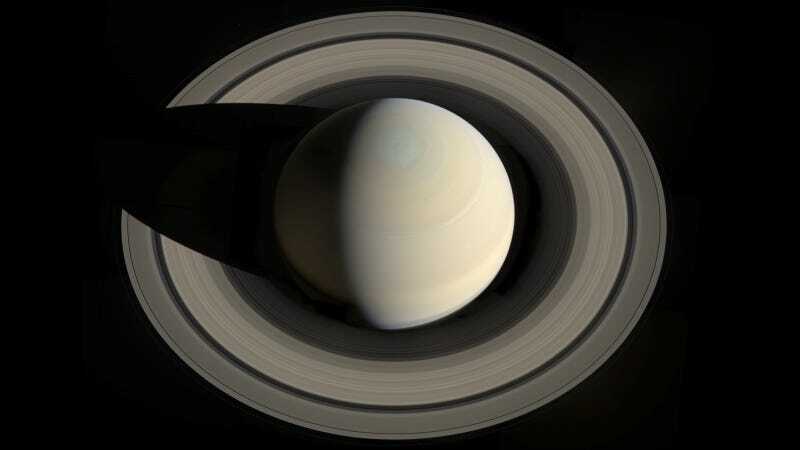 The rings, seen here from above rather than edge-on, appear far more circular than usual, their grooves, gaps and gradients presented in all their annular glory. The planet's north polar vortex – hexagonal in shape and an ethereal, spumy hue – is clearly seen from this angle. (NB: Image processor Val Klavans has also produced a close-up composite image of the hexagon, created with raw images collected by Cassini during the same October 10th flyby, to be featured in the forthcoming IMAX film In Saturn's Rings.) Also visible are the moons Pandora and Prometheus, near the one and two o'clock positions, respectively. As Emily Lakdawalla notes over the Planetary Society Blog, it's "a view never possible from Earth." Color us very, very impressed. Hats off to the Cassini team for composing this remarkable shot, and to Ugarkovic for assembling the raw images into this stunning composite. Word has it CICLOPS, Cassini's imaging team, is working on a jaw-dropping composite image of its own, to be released any day now; not that we doubt their abilities, but Ugarkovic's will surely be a tough act to follow. We can't wait to see what they come up with. Many thanks to Emily Lakdawalla, Gordan Ugarkovic and The Planetary Society for bringing this image to our attention, and allowing us to share it with you here!